When I'm going to be out running errands all day, one of my favorite meals to put in the oven or crockpot is a beef roast. For my dish I prefer sirloin tip or eye of round, but chuck roast is good, too. In addition to the ingredients below, my dad liked to put celery, yellow squash, and zucchini squash in his roast beef. This is the recipe I use when my whole family is getting together. If it is just my husband and me, I will cut the recipe in half. Roast beef is delicious, but having to eat it all week it just too much. Roast beef is one of the rare meat leftovers my husband doesn't enjoy eating after it has been frozen. 2-4 large onions, outer skin peeled off, and quartered. Put the roast in the roasting pan or crockpot. Salt and pepper the roast as desired. Spread the potatoes around and over the roast, then spread the carrots on top of the potatoes. Arrange the onions over the carrots. Sprinkle the garlic over the entire thing, then salt and pepper to taste. Add 1 cup of water. If desired, especially if the roast is very lean, dot the top of the onions with 1/4 to 1/2 cup butter, cut into 1 tbsp. slices. Cover and bake at 275 degrees F for 3-4 hours. 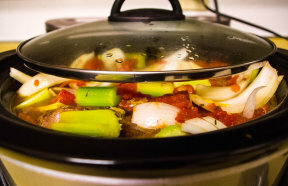 For the crockpot, cook 6-8 hours on low or 3-4 hours on high. Check to see if the meat is getting done. If necessary, cook 30 minutes longer. Spoon the vegetables into a large bowl. Lift the meat onto a meat platter. It should be falling apart tender. If desired, make a roast gravy from the drippings. A great recipe for brown roast beef gravy can be found at Simply Recipes: How to Make Brown Gravy. Serve with a lettuce and spinach salad or cole slaw. Do you have a favorite recipe for roast beef?